I’ve been a month in Fredericksburg, living just around the corner from locations of major Civil War battles 150 years ago. On Friday, I took a stroll down Sunken Road, a place where the Confederate Forces held a commanding position on a hill, and some 15,000 Union soldiers died trying to charge it. That’s war, what is it good for? This wall, likely reconstructed (?) 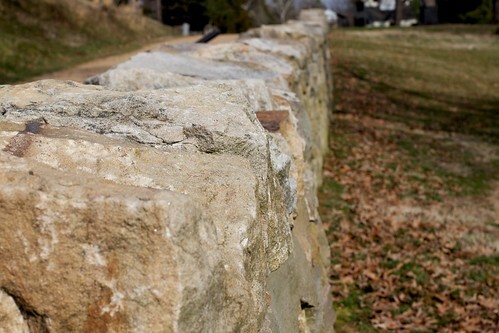 is part of the original wall that existed here, when ti was the major road to Richmond. Tonight I came across a stunning set of 48 photos in The Atlantic, part of their series commemorating the 150th anniversary of the Civil War, in this piece, showing photos of the locations. What’s remarkable, is that the war coincided around the time when photography started to be viable, and this was the first war (I am guessing) documented so much in pictures that brought the news to the eyes. What stood out is the sharpness of the detail, so much, especially in large format, how realistic the people looked. Of course they look realistic, they were there. This second battle is not the one I read about on the signs along the road. Apparently a year after the 1862 battle where the Union got slaughtered here, the Confederate troops went west on other campaigns, leaving a thinner number of troops along this road. (I am on thin ground of knowledge here, I am not a historian, just picking up pieces along the way). So what to do with this bit of synchronicity? I wanted to see what could do to blend these, even though they are from completely different positions along the road. What I did ended up a large file (about 2 Mb), so I am placing it below the fold. I hoped to play with the folding back and forth of time in Photoshop. This file has the two images- and two text fields with the date. On the animation timeline, I unfolded the extra fields on the left to get at the tools that allows me to make keyframes with opacity. What this means is I can set times when the opacity of the items change, and Photoshop does animation like tweening. As you move the timer along, you can see the effects- fading the photos in and out, fading the two dates in a cross motion. The third set of key frames has the same settings as the 2nd, which keeps the older photo in the middle. The fourth set fades back to the original settings, to make it loop cleanly. The problem with doing this is that it creates a bunch of frames and adds to the file size- this one is 67 frames. I don’t know why I played around with this; it was enough to put the images side by side. That was the start. 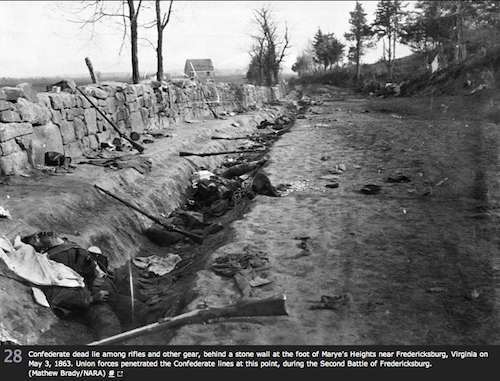 Have you see the Civil War Augmented Reality Project and the Gettysburg Battle app? Thanks Leslie, I came across the AR project when it was first proposed (I flew past Gettysburg on my east coast trip in October). I am literally surrounded by history here, you cannot spit and avoid hitting a battlefield.